To celebrate my recent birthday (thank you--oh, stop!--do go on...) I bought myself The Muppets soundtrack from the most recent Muppet film written mostly by Jason Segel (an interesting story in and of itself). It's only $9.99 on iTunes; in other words, I couldn't resist. As Casey and I basked in Muppet soundtrack glory, I got to thinking about Piggy and Kermit. A strange marriage from the beginning -- back before I even got the jokes they told I thought a pig and a frog getting married was hilarious, comedy gold! I began wondering about an odd aspect of their marriage: their relationship. Now, Kermit as we all know, is the leader, but the job seems to have been thrust on him by virtue of being the Muppet all the other Muppets knew. In case you don't remember, Kermit and Fozzie started the whole mess of Muppet excitement back in 1979 ('76 if you count The Muppet Show, but for my purposes, 1979... anyway). A bear in his natural habitat... a Studebaker! So Kermit ended up being the guy in charge of, well.. everything, despite the fact that he had little interest in leading. He was the protagonist because he was there and because the antagonist, Doc Hopper, was after his delicious froggy legs. Kermit really just wanted to be friends with everyone, including Piggy. Now Miss Piggy is famous for two things. One is her love of being famous. The other is her unquenchable obsession with Kermit. This is what love looks like, folks. She even went to the extreme of hiring a real minister in 1984's Muppets Take Manhattan to marry Kermit on a Broadway stage. Kermit, despite obvious misgivings, said "I do," apparently to appease the audience. Jim Henson, after the movie came out, said that Kermit's argument is, and will probably always be, "I'm just an actor and when two actors marry on stage, they're only acting." Looks pretty convincing, but who knows? In The Muppets (2011), (spoiler alert!) 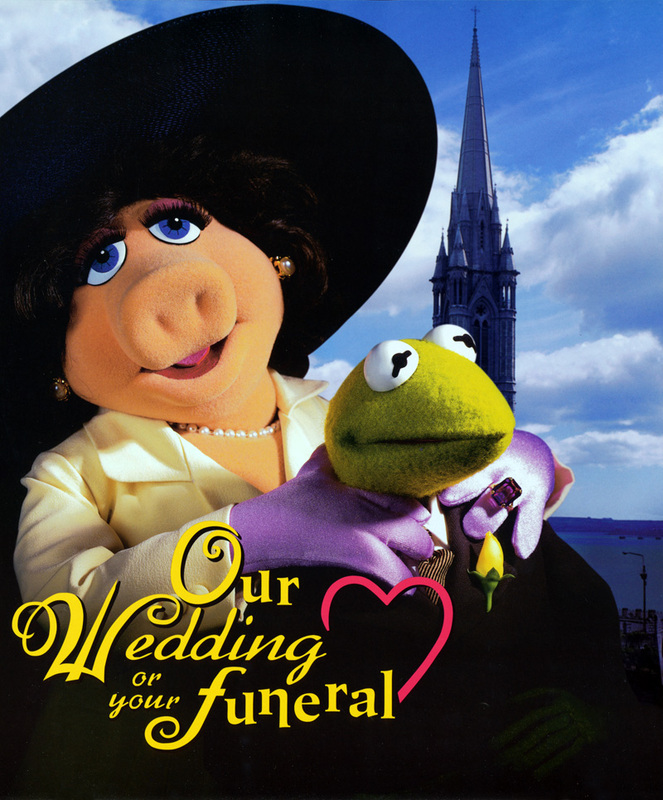 it becomes obvious that at some point between 1976 and 2011 they did in fact get married (the picture they use is actually of Miss Piggy and Kermit singing together at the Piggy-staged wedding in 1984, so there you have it). The thing is, they had some sort of falling out. When Kermit, '80s Robot, Mary, Gary, and Walter have gathered up those who Kermit insists to be "everybody," it becomes apparent that Kermit and Piggy haven't spoken in years. After some convincing, Kermit agrees that maybe they should go find Piggy, who has moved to Paris and is an editor for Vogue. The Muppets beg her to return, and she agrees on one condition... If Kermit will just admit that he wants her to come back and be with him. Kermit and Piggy go for a walk in the cool Paris evening, and have a rather heated discussion. Kermit blurts out, "Piggy, why do you always have to be so over-dramatic about things? You know it leaves me no choice but to do things that hurt you." Oh yeah, sounds like a healthy relationship to me. In the end, Piggy arrives just in time to be in the show with everyone, because, as she tells herself, "I don't have time to sit around and wait for you / haven't you heard? One is the new two!" 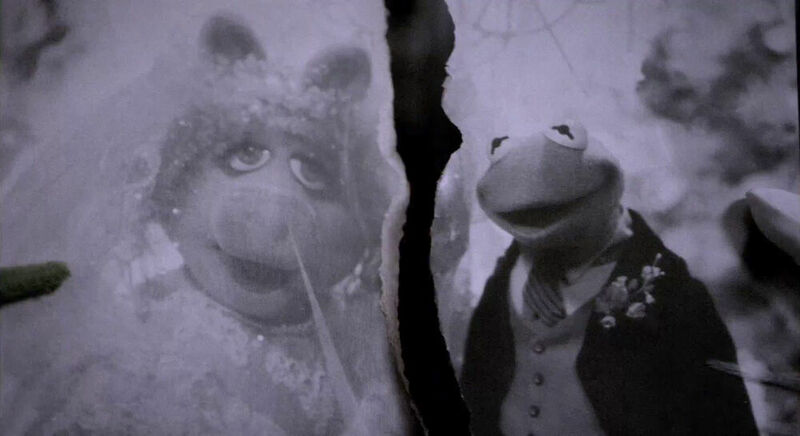 They do have a chance to step to the side backstage and Piggy realizes that Kermit kept his half of their torn photo from the 1984 wedding. Kermit finally works up the guts to say he needs her, and she is finally excited about appearing on stage with him again. Is there a real connection? Is it a rainbow connection? In what relationship are ultimatums healthy? Kermit obviously feels like he is being stepped on constantly with Piggy as his girlfriend/pig/wife/whatever and Piggy drags him every step of the way because of her obsession with him. Kermit has reportedly insisted in TV interviews that while they are not married, they are together. In an interview for The Muppets (2011), Piggy told a reporter, "We don't have to have trust in our relationship, because I know where he is at ALL TIMES." Back in 1993 they appeared together on Larry King Live and while Piggy insisted they are married (her married name is Ms. the Frog), Kermit said they are just friends and they have no intimate relationship, nor would they ever get married (watch first at 3:40 then 10:45). When Larry asked about Piggy's pay, she said, "Moi does not really think of money. Moi thinks of happiness with Moi's frog, and that's what really counts." Then she turns to Kermit, "RIGHT?" So while they might be married, they might not. They might be in a relationship, and it's probably unstable and unhealthy. Another rumor is that they are truly happy together, but they act like there are marital troubles to help Miss Piggy's career as an object of lust. Yeah, I guess that makes sense. So in the end, I guess this is just another case of what you choose to believe. What do you think? By the way, this was incredibly well researched. I was amazed at the detail collected--including clues about the relationship revealed in interviews.